Leeo, Inc. | What are Loud Noise Alerts? Home › Loud Noise Detection › What are Loud Noise Alerts? What are Loud Noise Alerts? 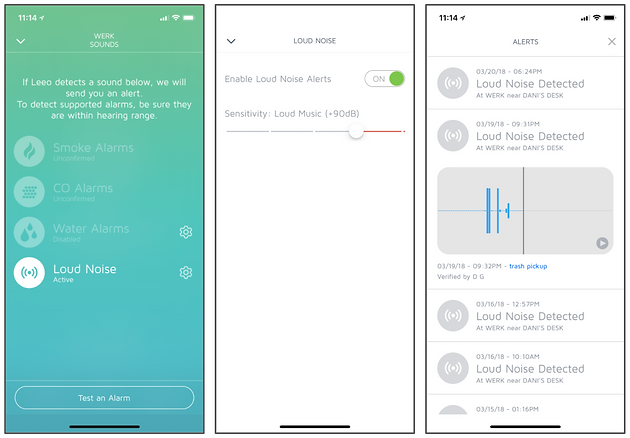 Loud Noise Alerts let you know if there's loud noises in your home while you're away. Enable loud noise alerts, set your threshold and you'll get a push notification any time Smart Alert detects a noise above the threshold. Follow the link in the push notification or go straight to the alert history screen to view and dismiss your alert. Designed to protect privacy, Loud Noise alerts feature sound playback with conversation masking.